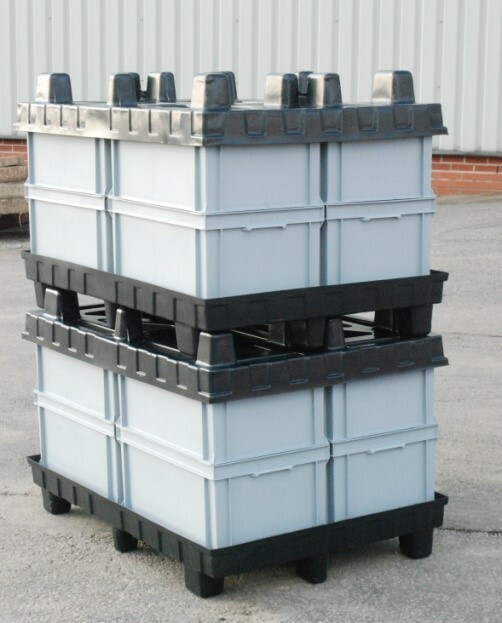 Euro stacking containers are a common feature within a range of different sectors. This is largely thanks to their unrivalled durability and a design that facilitates easy and convenient storage. In particular, euro stacking containers are great for industrial setups where the distribution process relies on modular capacities. These heavy duty containers are compatible with most conveyor systems and feature straight sides providing them with a much larger capacity compared with other containers. Furthermore, our euro stacking containers can also be tailored with lids, hinges, internal dividers, locking clasps and much more. If you’re looking to store parts, components or surgical equipment, then these containers are a perfect choice. Thanks to the smooth sealed surfaces, any contaminants such as dirt and dust are prevented from entering. Plus, these containers can be washed down without risking any of the contents. At CPP, we provide a wide range of injection moulded euro stacking containers that include high-quality stacking or nesting tote bins, attached lid containers, folding pallet and bulk containers. We also supply dollies that are compatible with our euro stacking containers. These containers can be personalised to your company and are available in a wide range of colours. As well as standard European sizes, we are also able to provide tailored solutions. Our euro stacking containers are an essential and cost-effective solution for all organisations. Not only do they minimise any unnecessary handling but they also help to keep valuable parts and materials safe. From storing engine parts and aerospace components to surgical equipment and other pharmaceutical items, euro stacking containers have many applications. As well as the sectors mentioned above, these containers are becoming more and more commonplace within the food sector too. This is largely due to the fact each container is comprised of food-grade polypropylene. Click here for the downloadable ‘Standard and Bespoke Stacking Containers’ PDF file. As a leading facilitator of specialised protective packaging and handling solutions, CPP are the number one choice for supplying euro stacking containers. Our team works closely with our customers to define, develop and deliver on every product. With our process driven approach, you can rest assured that you will meet both your budget and timescales. Our team maintains a focus on providing bespoke, reusable, multi-trip solutions that are fibre-free. We are fully ISO certified and are recognised by leading names who have our team to assist them on specialist projects. So, if you’re searching for bespoke euro stacking containers, there is only one name you need to remember – CPP.